SHOP EASY & SAVE MORE WITH US. 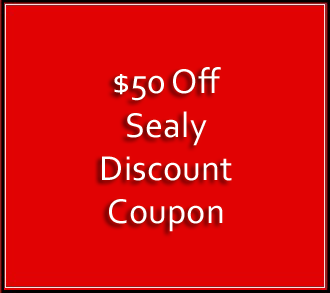 Gainesville, Florida's furniture and bedding discount coupons. We may have other promotions not listed here, so please call the store and mention this website for more information. We currently have several bed sets on special that will provide you with a perfect night's sleep and save you money, too. Gainesville, Florida's Mattress Experts! There is no furniture or mattress store more experienced or with a larger selection within a 100 miles radius of The Sleep Center. We are not salesmen, we are trained sleep professionals that never pressure and never push you to buy. A true no hassle shopping experience. 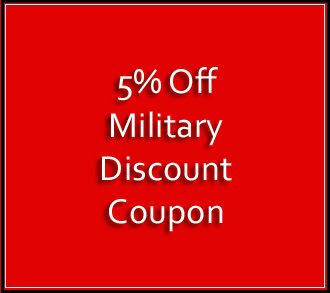 We also offer a few coupons below as a thank you for visiting our website today. We simply love saving you money and helping you sleep great! Looking for a Mattress Deal In April? The Sleep Center in Gainesville, Florida offers premium bedding products at the best value to you. Come shop our products and ask those questions you need answered and see why Gainesville, Florida voted The Sleep Center the best of the best in The Official People's Choice Awards by The Gainesville Sun. Come home to The Sleep Center and lock in the deal of your dreams. We have the perfect bed at the perfect price for the perfect you! 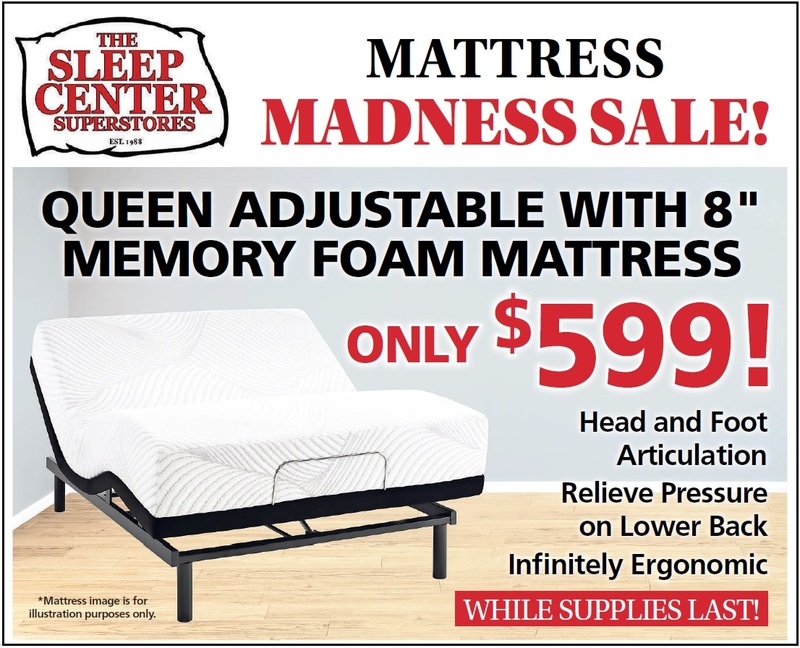 Mattress Madness Sale - Queen Adjustable Power Base with head and foot articulation PLUS 8" memory foam mattress - package only $599! While Supplies Last! Limited Time Sale! This combo deal brings the comfort of an adjustable power base and memory foam mattress at a price everyone can afford. Sealy - Take home a Sealy mattress from the Golden Elegance Collection. For only $499.00, you can get our Etherial Gold Queen mattress! Vibe - 12" Gel Memory Foam Queen Mattress by Vibe for Only $388! Bed In The Box - Our super sleeper is too low to advertise online. Call Us! 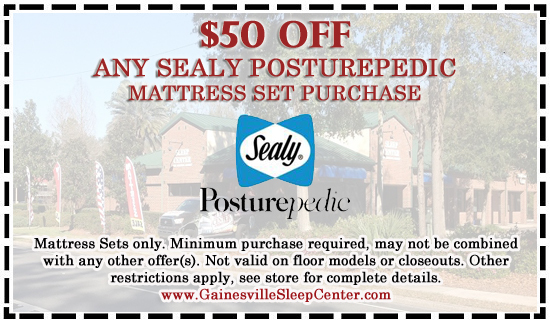 If you have any questions about these super specials or simply want to talk about sleeping great, just give us a call and speak with the mattress experts in Gainesville, Florida at The Sleep Center. We look forward to speaking with you soon, so please do get in touch with us today! Mattress & Futon Clip -N- Save Coupons. We know that saving you money is a very important part of our service to you. 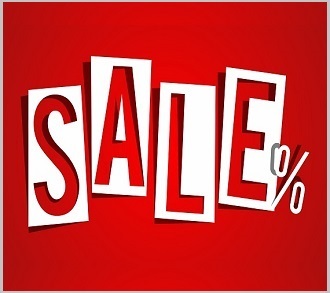 We are here to do just that and when we don't have a current super sale or special offer that fits your need, we still want to show our appreciation by offering a little extra discount by providing these valuable discount coupons. Simply click on the deal box and a new window will present the coupon for you to clip -n- save and bring in to us! 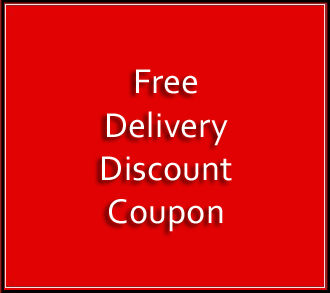 Gainesville, Florida's furniture and bedding discount coupons. We may have other promotions not listed here, so please call the store and mention this website for more information. We currently have several bed sets on special that will provide you with a perfect night's sleep and save you money, too. 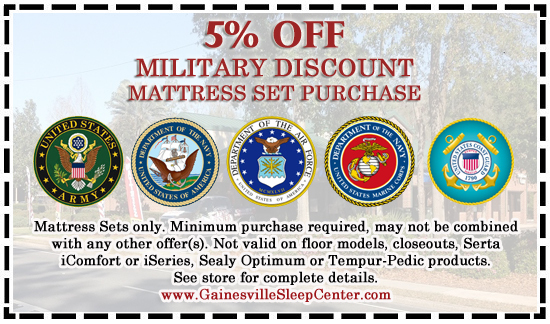 Gainesville, Florida's Mattress Experts! 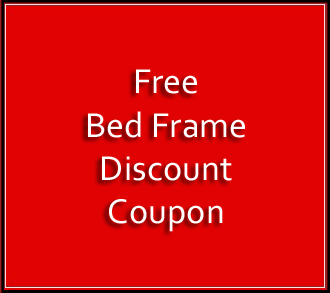 Free Bed Frame Discount Coupon. The Best Value in Bedding Products. The Sleep Center is a full service sleep specialty retailer with premium mattresses and sleep related prducts, offered at the best value to you. Please contact us with any offer from another seller and allow us the chance to beat it!